I’m very excited to release the last video that I filmed in Mexico! 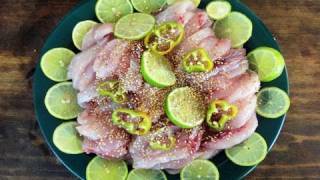 In this video, you’ll see how to prepare a raw fish meal with dipping sauce, and how to pan-fry fish in a very simple way. My hotel in Puerto Escondido, Mexico had a small kitchen, so I could cook fresh fish everyday during my stay. I cooked and shared with fellow travelers who were staying in the same hotel. I always believe that a raw fish meal is delicious in proportion to the number of people you share it with. I’ll post another blog soon about Bev and Chuck that you see in the video because I think it will be an interesting story for you to read. Wash and drain lettuce and cucumber and set aside. Cut the cucumber (and carrot, if you have some) into about 4 inch long pieces. 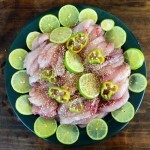 Slice limes (or lemons) and green chili peppers crosswise into pieces ¼ inch thick to use as garnish later and set aside. Cut fresh raw fish into bite size pieces and place it on a serving plate. *tip: cut one motion in one direction. If you cut like a saw, the fish will break and the cut will be ragged instead of smooth and shiny. Garnish with sliced lime, green chili peppers and sprinkle roasted sesame seeds on top. Let’s make 3 different kinds of delicious dipping sauce for hoe! Make the wasabi paste first by mixing 1 tbs wasabi powder and 2 ts water in a small bowl. Roll into a small ball and add ¼ cup soy sauce before serving. A savory and sweet soybean paste based sauce. Mix these ingredients well in a bowl: ¼ cup soybean paste, 2 tbs hot pepper paste, 3 cloves of minced garlic, 2 tbs worth chopped green chili pepper, 1 tbs honey, 1 ts roasted sesame seeds, 2 tbs vinegar, and 1 tbs sesame oil. A spicy, sweet, vinegary hot pepper paste based sauce. Mix these ingredients in a bowl: ¼ cup hot pepper paste, 2 cloves minced garlic, 2 tbs honey, 3 tbs vinegar, 1 chopped green onion, and ¼ ts salt. Lightly roast the seaweed and cut into pieces about 3×4 inches in size. Add soy sauce to the wasabi paste you made and mix it well. Place some rice on a piece of roasted seaweed. Add some sliced raw fish and the mixture of wasabi soy sauce. Wrap up the edges of the seaweed to make a packet. Eat it in one bite. Place some sliced raw fish on a leaf of lettuce. Add your favorite dipping sauce from either chojang or chodoenjang. You can add rice if you want. Wrap up the edges of the lettuce leaf to make a packet. Clean a fish and remove the guts. Fillet both sides of the fish. Slice the fillet into bite size pieces and sprinkle some salt on each piece. Salt the head and bones. Coat the fish, the fish head and bone lightly with flour. In a heated pan add vegetable oil generously and fry it until golden brown and crispy. Posted on Thursday, April 21st, 2011 at 3:53 pm. Last updated on August 7, 2017. Posted March 14th, 2013 at 9:45 pm | Log in to reply. I am going to be going to Mexico this coming May. Where is the fish market that you bought your fish from? I would like to go buy some fresh fish directly from the fishermen too. Posted December 3rd, 2011 at 2:41 pm | Log in to reply. maangchi, is the dip with the red pepper paste without soybean paste the dip usually prepared for cooked octopus or squid? Posted December 6th, 2011 at 12:41 am | Log in to reply. That’s right, it’s called chogochujang. Posted April 29th, 2011 at 12:05 am | Log in to reply. this is a great video! i love that you’ve taken your cooking to different places and incorporate it into where ever you happen to be! Posted April 29th, 2011 at 5:31 pm | Log in to reply. Posted April 21st, 2011 at 10:59 pm | Log in to reply. …May I make a small suggestion? I love your site and all the delicious recipes. I make this suggestion only to hopefully make it even better =]. I hope you don’t mind. you may possibly think about changing the ‘Hoe’ to Hwae, I think it’s closer to how the Korean pronounced. Posted April 22nd, 2011 at 10:46 am | Log in to reply. Thank you very much! I love your politeness! : ) I checked out Wikipedia and a few Korean websites to find out how they romanize the Korean word “회”. It looks like “hoe” is used generally. As you said, “hwae” may be right romanization? But if it’s written in Korean, it will be “후ㅐ”. I can’t type the word as 1 word. How about “hwe”? the sound is right, but it has to be written “훼”! Posted April 24th, 2011 at 5:13 am | Log in to reply. Posted April 21st, 2011 at 7:50 pm | Log in to reply. Can you eat the fried fish bones? Are they crunchy or too hard to eat? Posted April 22nd, 2011 at 10:28 am | Log in to reply. It depends on the type of fish. The snapper that I fried in the video has very strong and thick bones, so there is no way to chew and swallow the bones. : ) You will have to treat the fish bones as beef or pork ribs! lol And the fish head has lots of meat there. You can eat fish bones from crispy fried sardines. Posted April 21st, 2011 at 6:25 pm | Log in to reply. Posted April 22nd, 2011 at 10:15 am | Log in to reply. Posted April 21st, 2011 at 5:19 pm | Log in to reply. That looks so good! It was funny to see the dog trying to find food in the rubbish bin :) As soon as I can get good raw fish I am making this. Can you use Korean mustard instead of wasabi for the Japanese style sauce? Posted April 22nd, 2011 at 10:12 am | Log in to reply. I think you will have to use wasabi powder. I learned this simple method from my friend Yukiko about 13 years ago. Since then, I have been enjoying this simple method. This recipe was originally posted on April 21, 2011 at 3:53 pm by Maangchi. It was last updated on August 7, 2017. The video was watched 244,226 times on YouTube & has 1,766 likes!